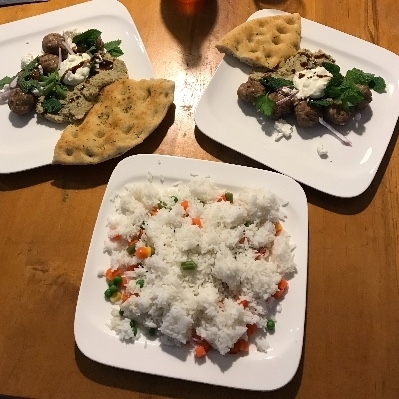 That’s how I sum up this 5 day challenge of living on NZ$2.85 worth of food each day. This experience has been great and one of the best challenges I’ve ever done for attempting to walk in the shoes of others to understand their reality. For someone who is used to training every day, often more than once, and also having a job that requires concentration a bit of lateral thinking, the amount of calories I’ve had this week just hasn’t stacked up to what I need to function at my best. 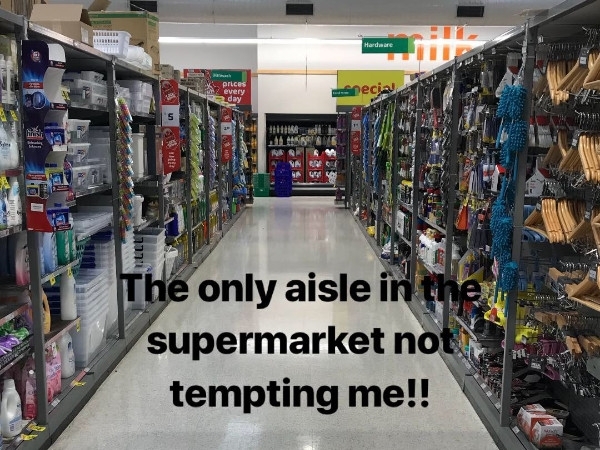 This is the biggest realisation I think: I could get by on $2.85 a day of food, but that’s all I would be doing... just getting by. I wouldn’t have the energy, motivation or concentration to thrive in any of my major passions/pursuits. 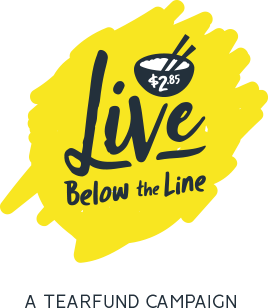 Thanks for following my progress throughout the Live Below the Line challenge. Extra big thanks to everyone who has donated!! Means a lot and provided such huge motivation during the last 5 days. So close to the goal amount right now... hopefully we can get there ? Having done my best to keep up with my cricket training this week, in particular all the fitness, today I've accepted the fact I just don't have the energy to do my planned session justice. I was meant to go for a high intensity run this afternoon after work, but it just wouldn't happen. 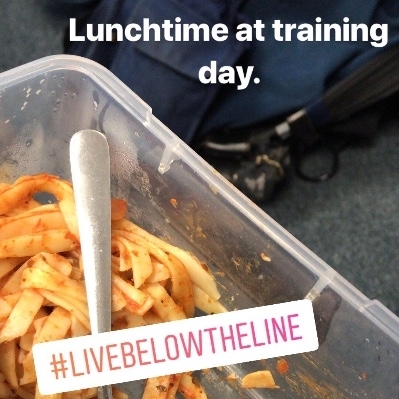 I'm not one to miss trainings and I know I will catch it up on the weekend, but if anything it's taught me yet another lesson... without enough food you can only push the boundaries for so long. I could have done the session today, but it would more likely have done more harm than good as I would not have been able to sufficiently replace the energy I would have used. This then leaves me with a big question (or more so realisation): How can people fulfil their personal goals and dreams (in other words: be the best that they can be) when they can’t fuel themselves enough to think clearly, train intensely, and recover sufficiently!? There is no way I could be the athlete I am if I were to face a lifetime of living below the poverty line. Simply impossible. The desire and will might be there, but without fuel to function in the end I would just grind to a halt. 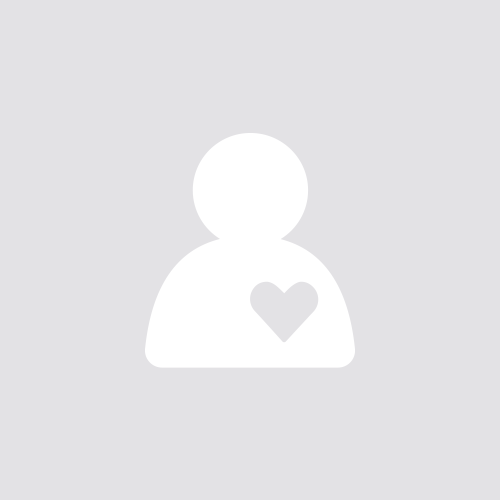 Tomorrow I’ll have trainings again – fitness first followed by a skills session. I’ve been a bit on a fumbling mess since Tuesday, so how batting goes tomorrow will be really interesting to see!! Stoked to see the donations on my page now over $800 and past the half way mark to my fundraising goal!! Thanks team. Love your support. 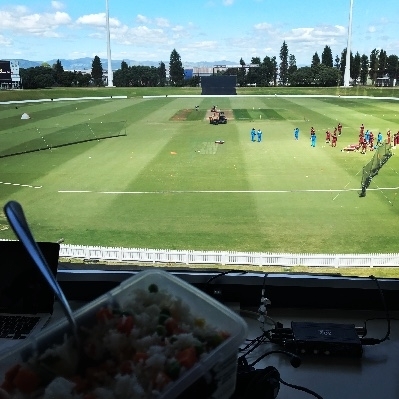 A bit of a road trip today as I went to Tauranga to help commentate the first of the T20 Internationals between the White Ferns and the West Indies. It was my debut in the commentary box and I think it went ok!?! ? Food wise, it was bananas and eggs to get me through my gym session this morning, before I hit the road mid morning for the Mount where it was rice and veges that would get me through the rest of the day. With energy levels a bit down on normal there was the odd stutter and absolute mind blank when doing the commentary... the number of times I could not remember my own friends/team mates first names because all I had in my head was their nickname was ridiculous!! A few random pauses resulted as the grey matter in my brain went into overdrive to remember AMY is Branchy’s real name! 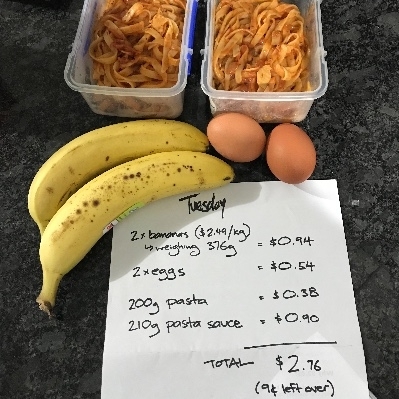 On the menu for Thursday is the same as I had on Tuesday... pasta, bananas and eggs. I’ve also got Police defensive tactics training tomorrow so that will add an extra challenge to my day!! Thanks for your support. Spread the word. Two more full days to go. Hump day done and dusted. Good night everyone. Tuesday... and it’s finally dinner time! Nearing the end of day two and this challenge is even harder than I thought it would be!! Getting used to that constant feeling of still being hungry, and being unable to do anything about it, has been a massive eye opener. When I start to think about my grumbly tummy I also think of all the people around the globe who live in this constant state of never fully being able to satisfy their body’s hunger. I’m humbled by them. Another lesson so far is my new appreciation for not wasting food. Last night I was literally scraping the pot bare of the pasta and sauce that I had prepared for my meals today. I didn’t want to waste a single spec of it! With three more days to go after tonight I’m sure I will learn even more about myself and just how blessed I am to live in such wealth by world standards. Thanks again to everyone who has donated so far. Please share this page with anyone and everyone! The more we raise the more we can change. Monday's kai is ready to go. 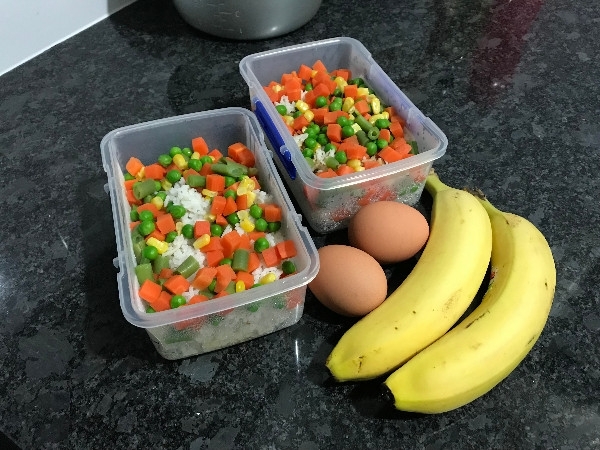 A banana before the gym in the morning, eggs afterwards, and then two lots of rice and veges to cover lunch and dinner. This gives me with 43c left over, but that doesn't even cover the cost of one mandarin!! Thanks to everyone who has already given their donations. Very humbling and motivating!! 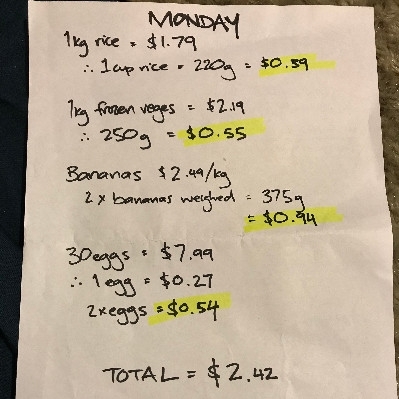 For five days (Mon 12 - Fri 16 March) I'll be living on no more than NZ$2.85 worth of food each day.  Yup, NZ$2.85... which is the international poverty line. I'm no cook and not very creative, so my diet is likely to consist of eggs, bananas, rice and frozen veges for these few days! 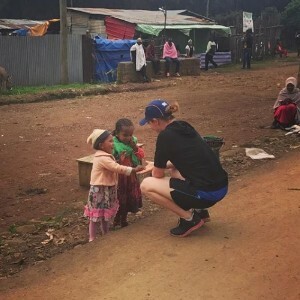 I had the privilege of going to Ethiopia and Uganda last year to visit my sponsor kid and through that trip I got a true glimpse into the harshness of poverty. Tearfund are a fantastic organisation doing awesome work around the world and I'm stoked that part of the money raised this year is going to 'self help groups' in India and Ethiopia (my favourite countries in the world!) where collaborative groups focus on the empowerment of women, their families and communities. Every donation, no matter how big or small, will help others around the world. All of us living in New Zealand are so blessed to do so... and now this is an opportunity to bless others less fortunate than ourselves. You are an excellent human. Shot sis. You inspire me - I'm proud to know you, support you and love you! 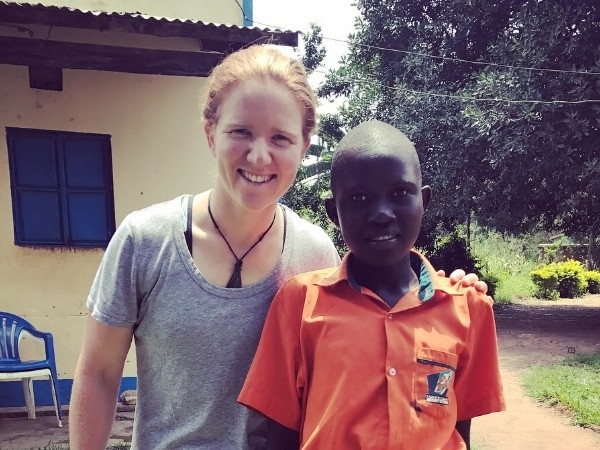 Katie you are so awesome with your heart for others. I so admire that you always find ways to make a difference in peoples lives. If everyone did what you did we would go a long way to solving starvation in the world. Putting my money where my mouth is!! Brilliant work Katie. Love the blog - particularly the bit about the fuzzy brain because of lack of food! I must say the rice and mixed veg sort of looked ok for one meal but having that again for dinner just made me feel miserable. You have really painted an excellent picture to help us focus on what it is like for so many people in the world. The scraping of the pot we can do if something was absolutely delicious but to get the last tiny morsel of food because we are hungry never happens. Thanks for what you are doing. You’re such an inspiration, all the best! well done katie -your heart is in the right place. You’re amazing! I know this challenge is hard, but maintaining your training schedule at the same time must be brutal. Kia kaha!! You are awesome Perk! Keep doing You! Loving your work! Shot Perks, you’re a legend. Yah good work, we did this a few years a good...I think we need to do it again sometime! Can't wait to hear about how good those frozen veggies tasted by the end of the week!! !